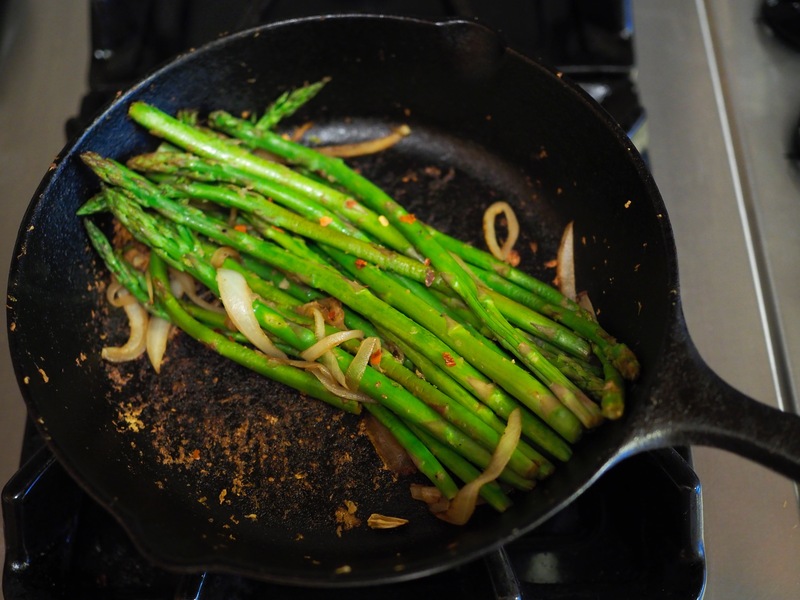 Lemon & Garlic Asparagus — Oh Wonderful! Summer is just on the horizon which means that sadly, asparagus season will be winding down. But while it lasts, I’m going to soak it in with a ton of steak and other meats. Per usual, my cast iron skillet came in handy for this easy spring recipe. It’s the perfect recipe to wrap up a weekend of wine tasting with (which I may or may not have done this past weekend). 1. Trim the ends off of your asparagus and gently pat dry with a paper towel. You want these to get a little crispy, but soft on the inside, so drying is key. 2. As your asparagus dries, mince the garlic, slice the onion, and juice the lemon. 3. Heat your cast iron or any heavy bottomed pan to medium-low. You’ll be gently reducing your onions and garlic for five minutes, or until the onions are translucent. Once your onions and garlic have cooked down, drop in your asparagus and cook for another 5-7 minutes or until they bend and shrink down 1/4 of an inch. 4. Finally, pour in the lemon juice which will sizzle. Stir your asparagus gently and top with cracked red pepper. Enjoy!